By Brooke Holland, Noozhawk Staff Writer | @NoozhawkNews | November 15, 2017. The concrete slabs underneath the Highway 101 overpass, connecting Santa Barbara’s waterfront and lower State Street, could soon come alive with an LED lighting installation or be adorned with murals. City staff is undertaking a project to redesign the underpass as a safe and inviting destination with lighting, interactive art elements and reconfigured lanes for cars and bikes. Johnson said the initial project budget is $100,000, and the project cost is expected to grow through community partnerships. More than 100 residents gathered Wednesday night at the Community Arts Workshop in Santa Barbara to share ideas on how to make the State Street underpass a welcoming destination linking the waterfront to the downtown area. The underpass project is one effort the city and community partners are tackling to enhance the vibrancy of the downtown corridor, in the wake of vacant businesses along State Street. Johnson said improving safety and access for pedestrians, bicyclists and vehicles is a project priority. Seven accidents occurred in the area between 2011 to 2013, she said. “The two intersections on both sides (of the underpass) have the top bicycle-involved accident rate compared to anywhere else in the city,” Johnson said. At the community meeting, attendees were given sharpie pens, sticky notes, food, wine and an hour to jot down ideas under five different categories such as art and design, sound, interactivity, project concerns and traffic flow. The blank white posters taped to the walls were filled with hundreds of suggestions. The “stench of urine” and “vandalism” were among the various topics under the concern category. 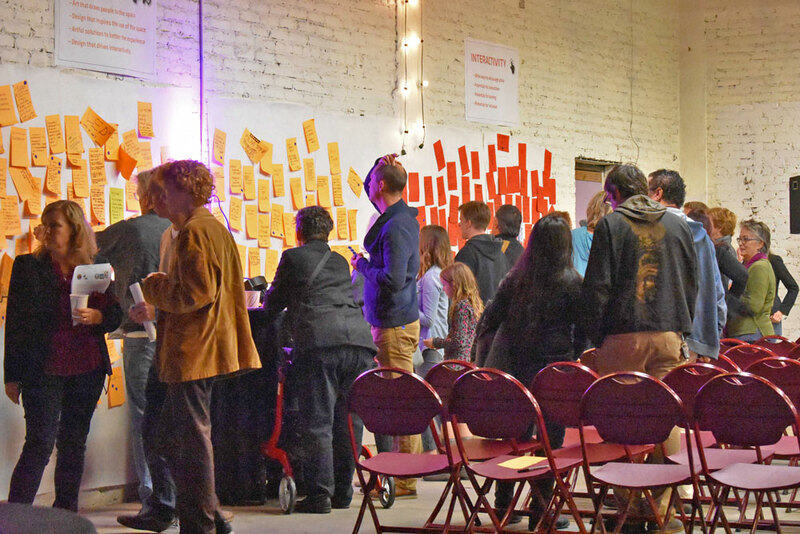 Attendees expressed ideas about how to reduce sound impact from cars and using technology to mitigate the noise of vehicle echo, engaging art designs and creative solutions to enhance and attract people to the space. More than 20 residents took to the microphone to share their plans about the future of the underpass. The speakers said the artist should be local, and whatever plans are used should come from the community. People suggested adding motion-tracking art, a multimedia space made to showcase work, tile murals that represent Santa Barbara, adding security cameras, wider sidewalks and reducing vehicle lane width, among other ideas. The city also created a Pinterest board of more than 100 images showing lighting, street elements, sound, landscaping and a new traffic reconfiguration. At the end of the workshop, community members were given 10 stickers and asked to mark the concepts they liked. The workshop notes will be available on the city’s website, Johnson said. City staff will seek additional project funding and build partnerships, as well as prepare a call for proposals with community input. A project design team is slated to form with city staff, architects, design professionals, art organizations and artists to review proposals. The project needs approval from Caltrans' and the Historic Landmarks Commission, and possibly a coastal-development permit. The underpass was built in the 1990s, according to Johnson.